Are you searching for a window blinds company in Bradford? Looking for a company that will install window blinds on a weekend? If you want to buy good quality windows blinds in Bradford then Impress Blinds will be the best choice for you. 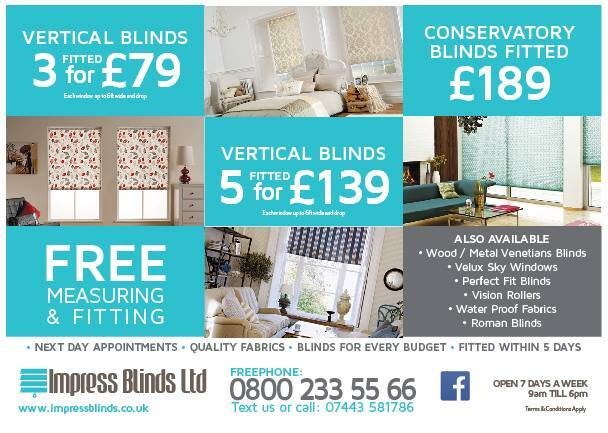 Impress Blinds provides wide range affordable blinds with great offers. We have a vast variety of textures and some offered in our deals. We proudly present vertical, roller, roman, conservatory, Venetian and wooden window blinds in Bradford. We have been serving our clients successfully in last couple of years in providing fitting of windows blinds to west yorkshire. We stock all fabrics and make and deliver as quickly as possible so you dont have to wait 2-3 weeks for a appointment as next day bookings are available. Our team members are exceptionally devoted and experienced in the window blinds industry and can guide you to the best covering of your window. how it works, you call or message and we book you in for a free measure up. Our team arrives at your given address we measure and show all options and samples so you get the feel of the blind you are buying. Once agreed we allocate a fitting time and we deliver wihin 3-5 days. We offer all type of blinds according to your choice in Bradford West Yorkshire.